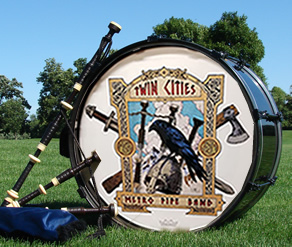 The Twin Cities Metro Pipe Band (TCMPB) is a top ranked Grade 4 competing pipe and drum band located in the Minneapolis - St. Paul, MN metro area. ...to the Twin Cities Metro Pipe Band web site. We are a top ranked Grade 4 competing pipe and drum band located in the Minneapolis - St. Paul, MN metro area. If you are interested in joining the band or would like to see what we are all about, feel free to stop in and check out our band practice. Directions and practice times are on our Practice page. If you are interested in booking the band for a performance or have an interest in sponsorship opportunities, please visit our Contact Us page for detailed information. We usually visit our local pub after Thursday night band practice to hoist a few...we'll keep a cold one for ya.